Hello. My name is Delia James, and I write cozy mysteries. I did not start out writing cozies. I’ve been lucky enough to write in most of the major popular genres. I started out in science fiction and fantasy. Since then, I’ve written young adult books and romance as well as cozy mysteries. Mysteries, though, are different, not just for the reader, but for the writer. All stories need a good structure. All stories need action with direction. Something, or a set of somethings, must keep the story moving forward. All stories, of course, need conflict, because conflict keeps the action moving and action gives the story its beginning, middle and end. But in a mystery, all these elements are more tightly tied together than in any other kind of story, because at the center of a mystery, there is one single question: whodunnit? Every other part of the story has got to support this question, and its answer. Now, let’s face it, cozies are tremendous fun, but they are not exactly realistic. They are a chance to spend time with characters we really enjoy, in interesting places doing interesting things. There is, however, one fact of real police work that has been true since the beginning of police work, and I stick to it, no matter what kind of magic or mayhem I’m writing about. Despite DNA evidence, GPS tracking, and closed circuit cameras, solving a crime involves talking to people. To me, this means that a mystery must be built around conversation. Now, I admit, this conclusion also comes from personal experience. Not with crime (thankfully), but theater. When I was a kid, very shortly after I fell in love with books, I fell in love with live theater. So, when started to write, alongside stories and novels (well, novel fragments, I was in eighth grade when I started), I wrote plays. I kept writing plays all the way through high school and college. In fact, I talked my way into a senior level playwrighting seminar when I was a freshman (now that was an interesting conversation). Plays are, of course, entirely about the dialogue between the characters and, occasionally between the characters and the audience. What the characters say and don’t say brings the story to the audience. This is also what brings the mystery to the reader — more than the murder or theft, more than the moment when the detective or the sleuth puts the pieces together. Conversation is this fundamental interaction between the characters that creates the crime, the cover-up and the solution. So when I’m starting a new mystery, I always start with a conversation. It might not end up being the opening of the book, but it will be the opening of writing the book. It can be very casual, something about the day, the town, or, in the case of A Familiar Tail, the very weird cat that has been hanging around. I’ll probably have a few early chapters all filled in with action and descriptions to make sure I’ve got a handle on the setting and the characters. But the middle of the book, for a long time will be nothing but a lacework of conversations. The conversations get labeled with characters and subjects, and they get lined up in a kind of electronic index card system (I use the word processing program Scrivener, which is really, really good for this kind of thing). I’ll bop back and forth between these conversations, filling in the action and settings, switching around the words, coloring in the characters through their words — their humor, their emotions, their reactions to each other. I’ll rearrange them, and put them back, and take them out, and put them back in. I’ll fill in the action and the settings. I’ll go to the beginning and adjust that. I’ll go to the end and adjust that, and slowly everything will line up and the relationships between the conversations, and the characters, will become clear. And that’s when I’ll really know whodunnit, and what, exactly, it is they’ve done. 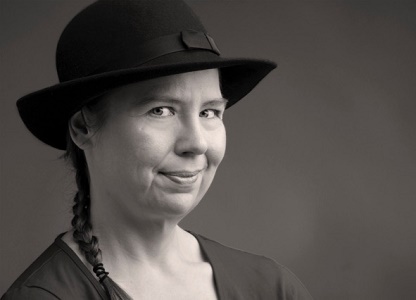 Delia James writes her magical mysteries from her home near Ann Arbor, Michigan, assisted by her loving husband, Tim, her magnificent son, Alex, and her vocal cat, Buffy the Vermin Slayer. 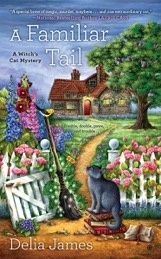 A Familiar Tail is the first of her Witch’s Cat mysteries. To hear more about the series and read a sample, you can go to her website, where you’ll be able to seen the latest news, order the latest book, like her on Facebook, and follow her on Twitter.